The latest polling shows the Democrats as having a 76% to 80% chance of winning the House and the Republicans a 69% to 72% of retaining control of the Senate. Prediction markets have the Democrats at a less optimistic 66% to 76% for the House and the Republicans at a similar 68% to 71% for the Senate. 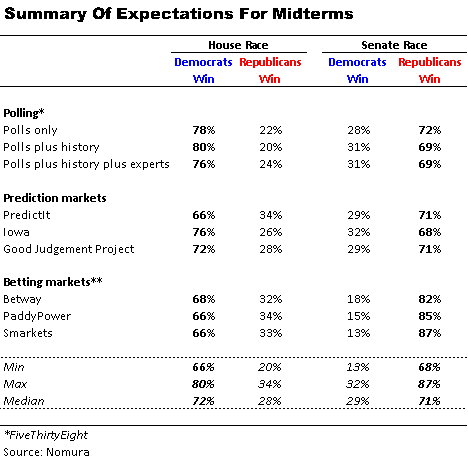 Finally, betting markets have the Democrats at the less optimistic 66% to 68% range for the House and the Republicans at a much higher 82% to 87% for the Senate. So it looks like prediction and betting markets are skewing risks to the downside for the Democrats compared to the polls for the House and they are skewing risks to the topside for the Republicans compared to polls for the Senate. In general, expectations are for the Democrats to win the House and the Republicans to retain the Senate. 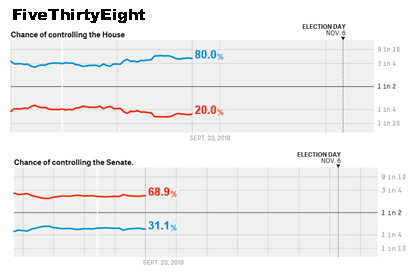 This has been the case for much of the year (see FiveThirtyEight charts) and compared to the 2010 mid-term election in Obama’s first term, the Democrats advantage appears to be more stable going into the elections (see second set of line charts). Our US Economist, Lew Alexander, laid out the implications for a split Congress – no more fiscal actions, more trouble for Trump in terms of investigations and continued protectionism. So for markets, it is not too different from recent months. Finally, as an aside, it’s fun to see what betting markets are saying as potential Presidential challengers to Trump. Kamala Harris, Elizabeth Warren and Bernie Sanders are leading the pack, followed by Mike Pence (on impeachment risk?). But there are few non-politicians entering the list – Dwayne ‘The Rock’ Johnson, the lawyer Michael Avanetti (he represents Stormy Daniels), Oprah and Jamie Dimon. The odds are small, and so this more for amusement than anything else, but it suggests a much less conventional field in coming elections.